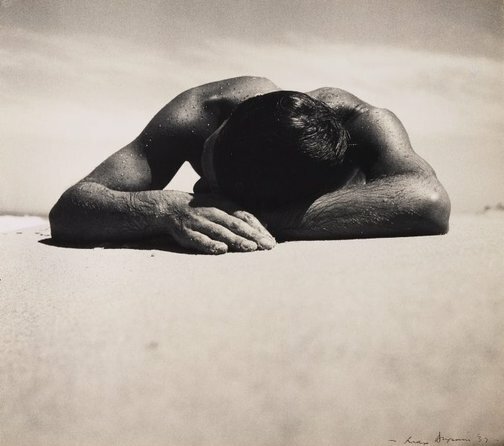 Although Dupain took some photographs of his friend as the sunbaker in the 1930s, this image did not appear until his monograph was published in 1948.2 The image he chose was slightly different, a little less monumental due to the positioning of the arms, and with less sand and more sky. The negative was lost and in the 1970s the other version was printed for the first time and, through exhibition and reproduction, became the icon that it is today. The ‘Sunbaker’ represents the shifts in Dupain’s practice from private snapshot to public domain, from ardent modernist experimentation to determined recording of actuality and form.4 Within this image is Dupain’s pervasive interest in the individual body as a metaphor for social wellbeing and an exemplar of pure form. Signed and dated l.r.image and verso board., ink "Max Dupain '37". The photograph and Australia , Sydney, Jun 2015, 104 (colour illus.). Judy Annear, Photography: Art Gallery of New South Wales Collection , 'Australian modernism', pg.131-149, Sydney, 2007, 136, 142 (illus. ), 195. Natasha Bullock, Look , 'Soft and sharp: how Australian photography moved between two styles', pg.21-22, Sydney, Oct 2002, 22. Sandra Byron, Art Gallery of New South Wales handbook , 'Photography', pg. 125-135, Sydney, 1988, 127 (illus.). Onsight No.7 - PROFILES , Sydney, 1984?, 22 (illus.). Bruce James, Art Gallery of New South Wales handbook , 'Australian Collection: Australian Photography', pg. 198-207, Sydney, 1999, 204 (illus.). Robert McFarlane, Black + White - The Masters , 'Max Dupain', pg. 194-207, Sydney, 1999, 195 (illus.). Gael Newtown, Brought to Light: Australian Art 1850–1965 from the Queensland Art Gallery collection , 'It was a Simple Affair. Max Dupain Sunbaker', pg. 142-47, Brisbane, 1998, 142 (illus. ), 143 (illus. ), 144, 146-7. Judith White, Look , 'Sydney-side-on', pg.28-29, Melbourne, Apr 2000, 28 (illus.). Author Unknown, Workcover News , Sydney, 1995, cover (illus.). Unknown, Art and Design Book 1 , Sydney, 1995, 144 (illus.). Sand in our souls , 'The beach and popular culture', pg. 138-145, Carlton South, 2001, 141, 142 (illus. ).